Japanese firms explore information about investment in Can Tho city at the forum. Localities in the Mekong Delta region introduced 63 projects, including up to 12 in high-quality agriculture, to call for investment from Japanese firms during a Japan-Mekong Business Cooperation Forum in Can Tho city on November 3. The event was jointly held by the Vietnam Chamber of Commerce and Industry (VCCI) and Japan External Trade Organisation (JETRO) in Ho Chi Minh City and gathered 400 delegates representing government agencies and localities of the two countries, Japanese trade promotion organisations, economic experts, Vietnamese companies, and 120 CEOs from Japanese firms. Addressing the forum, former State President Truong Tan Sang affirmed the significance of the event in strengthening the economic and trade exchanges between Japan and Vietnam’s Mekong Delta, while expressing his wish that Japanese investors would pay more attention to this region. Leaders of Mekong Delta localities should create favourable conditions for Japanese investors to implement effective and win-win cooperation in the context that the Comprehensive and Progressive Agreement for Trans-Pacific Partnership (CPTPP) is going to take effect with 11 member countries, including Japan and Vietnam, Sang emphasised. According to VCCI Chairman, Vu Tien Loc, Japan’s investment in the Mekong Delta region remains limited despite the huge cooperation potential between the two sides. He mentioned the young and well-trained labourers and a development space for businesses as the biggest advantages offered by the Mekong Delta, stating that cooperation in agriculture, the processing industry, manufacturing, tourism and commercial services are the region’s yet-to-be-exploited potentials that Japan would be the best partner to develop. As a leading country in developing adaptive agriculture to climate change, Japan’s experience will effectively serve the Mekong Delta region which is in need of an agricultural sector with climate-adaptive technologies, he said. Kawaue Junichi, Consul General of Japan in HCM City, stated that, together with the development of the Japan-Vietnam relations over recent years, the ties between Japan and the Mekong Delta have also been increasingly expanded across various spheres, such as transport, trade and especially farm produce. The cooperation areas between the two sides currently include the supply of high-quality farm produce for the Japanese market, new markets for Japanese and Mekong Delta travel agencies, and financial, credit, delivery, medical checkups and treatment, education and vocational training services, among others. As shown in VCCI’s statistics, as of October 2018, the Mekong Delta had attracted 169 FDI projects from Japan with a combined registered capital of US$2.21 billion, accounting for 10.5% of the whole region’s total FDI inflow. Delegates cut the ribbon to inaugurate the Vietnam-Japan friendship industrial zone in Can Tho city. 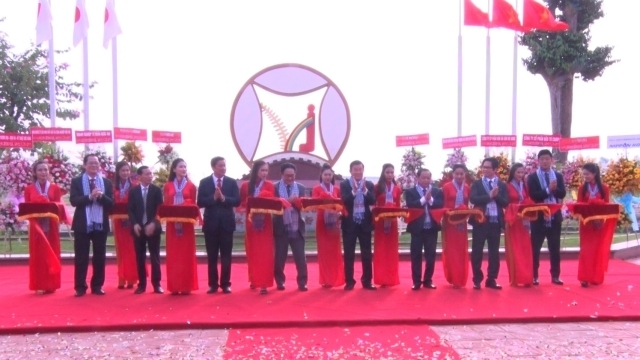 On the same day, the Can Tho municipal People’s Committee put into operation the Vietnam-Japan friendship industrial zone which covers 30 hectares for the first phase in Tan Phu ward, Cai Rang district.